In one of the wettest summers on record, as boaters dodge floating debris sent down from the Conowingo Dam, jellyfish have been few and far between. 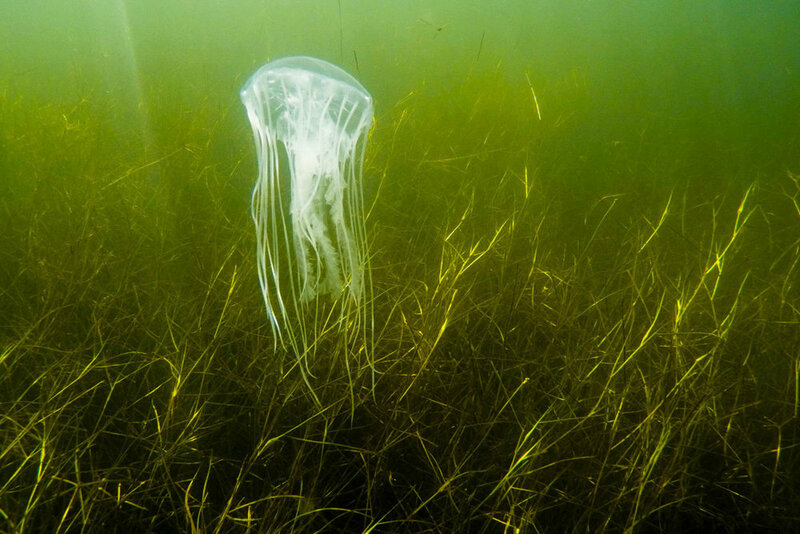 In fact, scientists tell Bay Bulletin that bay nettles, the jellyfish we know best, may be more scarce this year than ever before. Denise Breitburg, a senior scientist at the Smithsonian Environmental Research Center (SERC), says multiple factors resulting from this summer’s rain are probably contributing to the scarcity of nettles. Salinity in many areas has been below levels that nettles can tolerate, let alone reproduce. The high water flow rates we’ve seen this season have physically washed nettles and ctenophores (comb jellies) out of tributaries and down the Bay. And, says Breitburg, over several decades, rising water temperatures have reached levels that are harmful or even lethal to jellyfish. The lack of stinging nettles may be welcome news for those who like to play in the water—paddleboarders, jetskiiers, wakeboarders, swimmers, and the like—but environmentalists worry that their absence could throw the ecosystem out of balance. The summer’s many rainstorms, including the remnants of Florence, put unusually high amounts of fresh water into the Susquehanna River, and in turn, the Bay. The U.S. Geological Survey estimates the Bay saw its highest monthly water flow on record in August, and second-highest monthly water flow in July. All that fresh water dilutes the Bay, changing its salinity. The bay nettle is typically found in the Bay’s middle tributaries and prefers salinities of 10 to 20 parts per thousand. It’s essential to the ecosystem because it is one of the primary predators for comb jellies, which prey on oyster larvae. According to the Chesapeake Bay Program, comb jellies tolerate a wider range of salinity, so they may have a bigger impact on oyster populations without bay nettles to keep the the comb jellies in check.